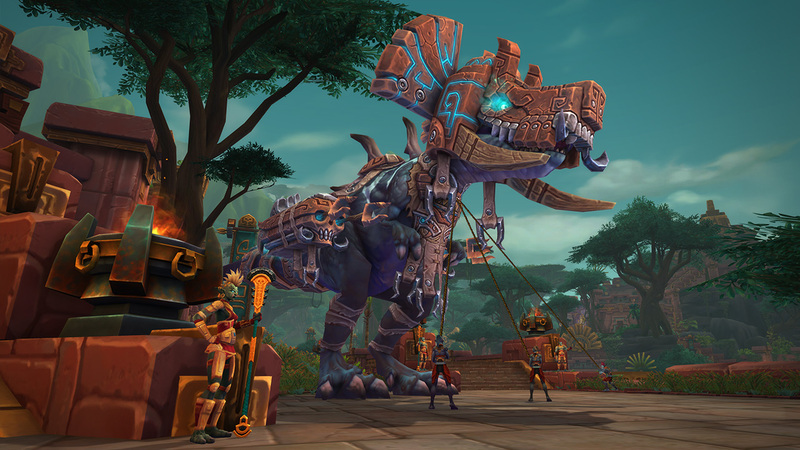 Located deep in the Zandalar subcontinent and nestled in a primal jungle, Zuldazar is a remnant of the once-mighty Zandalar empire. Join us on a brief tour through the oldest city in the world and the majestic land that surrounds it, and get a glimpse of the flora and fauna that dwell in this ancient domain. High above the jungle canopies, the Golden Throne serves as Zuldazar’s city center, with some of the most breathtaking views in the region. It is from here that Rastakhan, king of the Zandalari, rules. A vast, ancient cityscape of interconnected terraces sprawls out below, dotted with temples devoted to the loa, which are maintained by their loyal servants. Things aren’t as they should be in the great empire. The land is charged with dark secrets, and rumors of a rebellion swirl. As a representative of the Horde, you’ll need to earn the trust of King Rastakhan and the Zanchuli Council to gain access to Zuldazar’s resources and superior naval force. The Horde’s war efforts depend on it. Visitors can find anything they need for an extended stay in the heart of Dazar’alor at the center of the city. Facilities include an inn, portals to Orgrimmar, Thunder Bluff, and Silvermoon City, profession trainers, a bank, training dummies, vendors, and more. It’s easy to get lost this ancient, multileveled city—but that only emphasizes its vastness and grandeur. If you’re determined to explore the city and its surrounding areas, you’ll want to pack your walking shoes and bring a well-rested mount. There are thousands of steps throughout Zuldazar. Just be careful to keep an eye out or you’ll plummet into one of the many thunderous waterfalls surrounding the city. But the view is breathtaking! Things to Try: Take a ride on a Caravan Brutosaur! 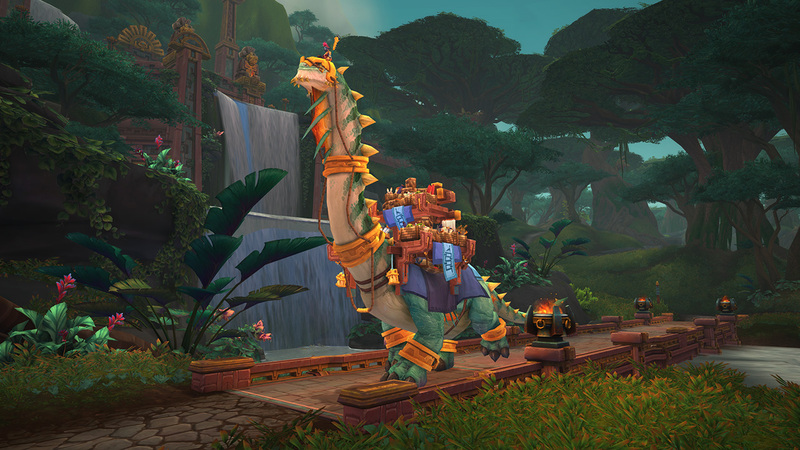 Trained to haul goods throughout Zuldazar, Brutosaurs offer a slow but steady ride around the city’s terraces. Worshipped as deities by the Zandalar trolls, loa are Wild Gods—or spirits of Azeroth. Many of the temples dedicated to these deities can be often found on high ground or mountain peaks, which are viewed as sacred ground by the devout. Did you know? Atal’ai means “the devoted ones” in Zandali. 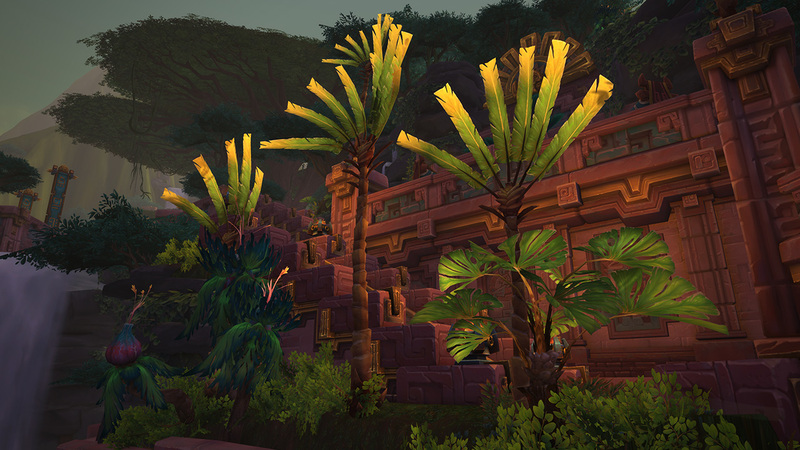 In the southern part of city at its lowest point, you’ll find the expansive Port of Zandalar. It is here that the Zandalari berth their mighty fleet and traders from around Azeroth sell their wares and services. For those of sufficient might (level 115) and have completed an introductory quest, Captain Rez’okun will facilitate access to Island Expeditions from the Expedition Map. Zandalar’s rich tapestry of flora and fauna deserve research and cataloguing. The Zandalari have shown themselves to be able beast masters, having domesticated many of the creatures that roam the land. 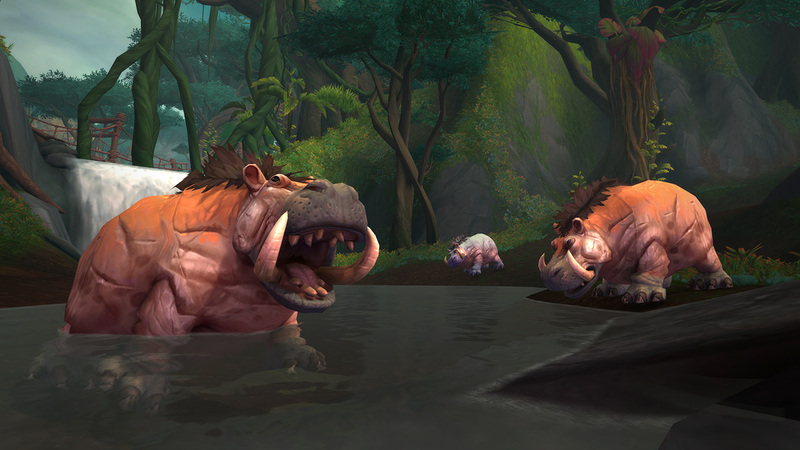 Some of these serve as helpful allies to the Zandalari; others prove obstacles to those who would seek to exploit the jungle’s resources. Tamed Ravasaurs, Brutosaurs, Pterrodax, and Direhorns make up just a portion of their menagerie. There are countless other wild beasts that make their homes in surrounding jungles, from Muddy Riverbeasts to Roaming Nibblers. Both inside the city and beyond its borders, you’ll encounter a new race: the tortollan. These ancient seekers are constantly in pursuit of knowledge and the acquisition of rare artifacts. They’re always in need of brave souls to help them acquire what they seek. Aiding them can be risky, but ultimately it will be worth your while to have these erudite people on your side. If you follow the Golden Road from the city and up into the mountains to the west, you’ll eventually reach Atal’Dazar. These ancient pyramids have served as the resting place for Zandalari kings for millennia. With each passing ruler, new rooms are constructed to house the deceased’s vast wealth. Atal’Dazar serves as the staging grounds for two new dungeons: Atal’Dazar (exterior) and King’s Rest (interior). Atal'Dazar and King's Rest Dungeon Spoilers Inside! For millennia, the Zandalari kings were laid to rest within the tombs of Atal’Dazar, secluded high atop the mountain Mugamba. These pyramids grew more elaborate with each passing ruler, as new rooms were constructed to house the deceased’s vast wealth. Now, these once pristine halls have been corrupted by the Prophet Zul and his trusted lieutenant, Yazma, who seek to twist the power of these ancient kings for their own dark machinations. Priestess Alun'za: As a fanatical defender of Atal’Dazar’s golden sanctum, Priestess Alun’za has come to cleanse the temple of all corruption at any cost. Vol'kaal: In life Vol’kaal was a trusted bodyguard of Yazma. Since his untimely death, she has used her newfound powers to reanimate the corpse of her former lieutenant who can now serve for eternity. Rezan: Rezan, once a loa to the Zuldazar kings, had his soul torn from his body during a ritual. Now, only a twisted husk remains, bent on devouring anyone who enters his hunting grounds. Yazma: Having consumed the might of Shadra, the spider loa. Yazma is now tasked with holding the sacred temple of Atal’Dazar for her master, the Prophet Zul. Few places in Zandalar are more sacred than Kings’ Rest. 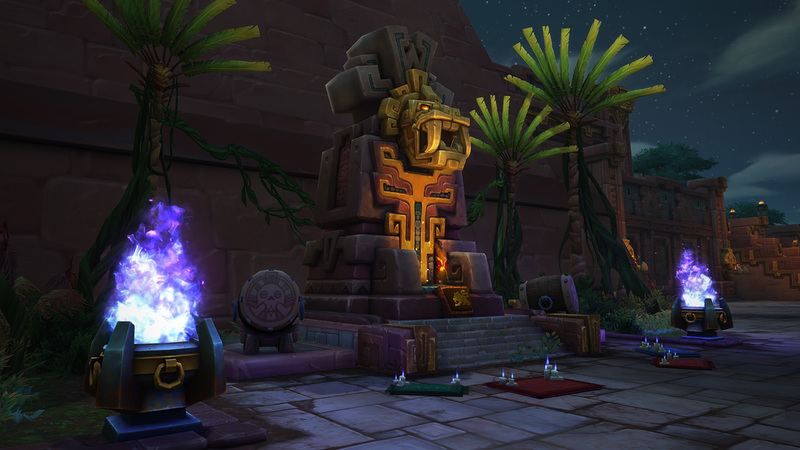 Every king, conqueror, or tyrant who has held control of the Zandalari empire is housed within this great city of the dead to protect and honor not only their bodies, but also their spirits. Entry has historically been restricted solely to the Zandalari priesthood and royalty, but as Zul’s dark magic winds its way through the tomb you must venture inside and put an end to the darkness that has found purchase there. The Golden SerpentKings’ Rest has come under attack before. 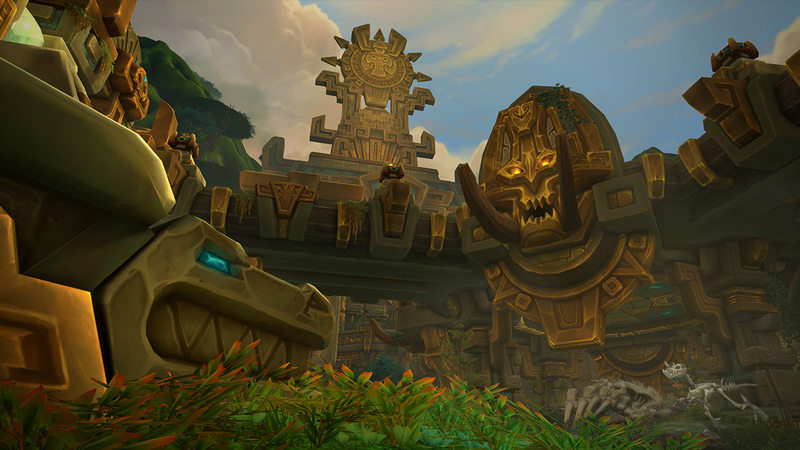 After a foolish troll tried to summon Hakkar the Soulflayer to this island many millennia ago, the priests of Zandalar created a mighty construct to defend this tomb. The Golden Serpent has stood against intruders ever since, judging who is worthy to enter these sacred halls. There was once a caste of Zandalari whose purpose was to preserve and defend the remains of past rulers. But when a terrible plague of corrupted blood tore through the empire, it was too risky for mortals to handle the dead. Golems were summoned for the grim work of preservation and burial; they have been used ever since. The Council of Tribes: There was once a time when no single emperor could rule Zandalar. After a period of civil war, the heads of three families formed an uneasy coalition and tried to rule the empire together. Though they did not often agree, there was peace in Zandalar. Briefly. Dazar, The First King: Dazar. The founder and first King of Zandalar, who led an exodus of his people out of the muck and mire and built a city of gold. The first tamer of raptors. The warrior undefeated. The father of a kingdom. His eternal repose cut short by Zul’s dark magic, it lies to you to once again put him to rest. 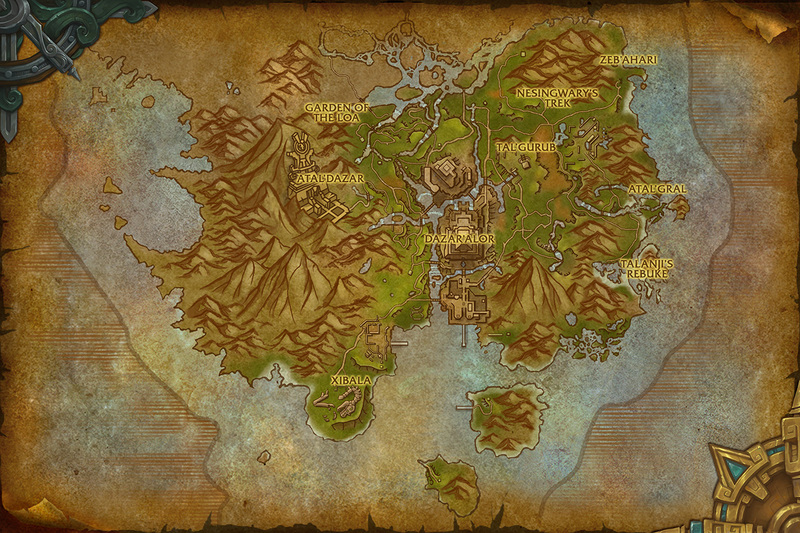 A vast coastline surrounds Zuldazar to the south, east, and west, offering bountiful opportunities for fishing, boating, swimming, and treasure hunting. To the north, the marshland of Nazmir awaits exploration, offering plenty of opportunities to earn your way into the good graces of the Zandalari.